When new parents think of purchasing items for a twin nursery, the thought of buying baby furniture to accommodate TWO may cause panic, or at least some level of bewilderment. Visions of future credit card debt can make any mom or dad break into a sweat. However, there are ways to cut corners, find bargains and make furnishing and decorating a nursery for twins much less expensive. Here are a few tips and ideas to get you thinking frugally, starting with the main furniture pieces and ending with decorations and accessories. That Looks Like a Million Bucks! New parents may think they need two bassinets and two cribs. The frugal shopper will likely choose to skip the bassinets, which are typically viewed as an extra or bonus item. The cribs are a necessity, but the bassinets are only used for a few months, and then stored in the garage, given away, sold or dumped. When shopping for a crib or cribs, keep your eyes open for a bargain on a convertible style crib, which can transform from a crib, to a toddler bed, and then a full size bed. If you can invest in a convertible crib, it would alleviate the cost of two beds in the future. You may even know a friend or family member who would be willing to give or sell you their child's old crib. Just be sure to read over our Crib Safety Guide when considering this option. Of course, having twins co-sleep in the same crib is even more affordable than buying two separate cribs. The decision to let twins co-sleep can eliminate the expense of another crib for up to six months or so. But you should definitely speak to a pediatrician about this alternative before hand to see if it's the right choice for your twin nursery. A dresser for twins is an item that can oftentimes be picked up at a yard sale. Thrifty shoppers know that purchasing a full-sized dresser is more economical than buying a small dresser, especially when you need the extra room for twin clothing Remember that you will eventually have to turn the twin nursery into one or both twins' "big kid" bedroom, and a smart investment now can grow with your twins through the years. Don't be afraid to buy an older dresser or even two (if you have the space). An older dresser can be as good as new with just a coat of paint and some TLC, assuming all hardware is working well. There are lots of ideas that can be found online for refinishing old furniture. The best part is creating a piece that's just right for your space. On a side note, it may be possible to have the dresser double as the changing table. As long as the top of the dresser is wide enough and sturdy enough you can simply add a nice changing cushion and you're set. The Babyletto Babyletto Contour Changing Pad is an affordable option. The changing table may seem like a luxury for the frugal shopper. They are handy to have, but definitely not a necessity. 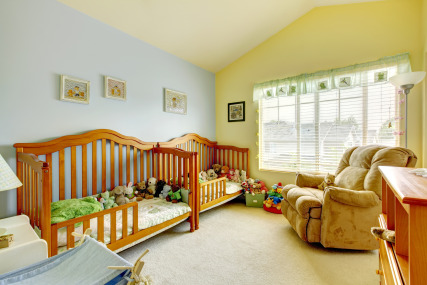 Not to mention, space can be limited when you are furnishing a room for twins. Try checking out places like the Salvation Army and Goodwill as well as yard sales. These tables are often discarded when the baby outgrows them. Another option for a cheap changing table is to convert a full-size dresser into a changing table (as mentioned above). If you search online, you can find instructions to easily turn your dresser into a safe place to change your babies. The changing table is an item some moms choose to do without, and instead, set a blanket on the floor to change their babies on. Another benefit of this option is being able to change your twins just about anywhere in the house, not just the nursery. Stocking and decorating a nursery for twins, although fun, can be quite frustrating. The mom on a budget not only has to make every penny count, but she also has to determine where to invest more, and where to invest less. Lamps, art, figurines and other miscellaneous accessories, can be purchased either new, or used, and still be in your budget. If buying used items is a better option for you, then check out your local yard sales, and thrift stores. You should even check eBay before spending any money. Oftentimes, people buy items and then do not use them and sell them on eBay for cheap. If youre artistically inclined, you should think about getting crafty and create some of your own decorations and accessories. There are lots of sites that offer cool ideas even step-by-step directions. The price of a full set of crib bedding (crib skirt, sheet, bumper, quilt/blanket, pillow case) can really run the gamut from super expensive to totally inexpensive. Some designer crib bedding can cost hundreds of dollars or more! But don't think you can't have a nicely coordinated crib set on a budget. With more than a few affordable stores to choose from , like Target, Walmart and BabiesRus, you are sure to find reasonably priced bedding for your twin nursery. There are so many options for decorating the walls of the nursery, the possibilities are endless. Wall papering the entire wall is much more expensive than painting. It's an option, but consider the expense. A less expensive alternative would be to choose a room border instead. Many borders come already decorated and are self adhesive to boot. Painting the wall or border yourself can be even more budget-friendly and fun too. Before you purchase any paint, it's a good idea to seek advice from your local paint or hardware store. A professional in this area will be able to give you creative ideas and pointers, as well as advise you on what type of paint to buy. Hanging framed art or posters about twins is yet another inventive way to decorate wall space. 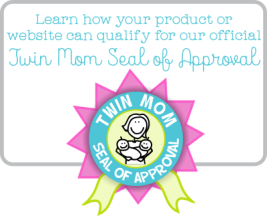 The floors in your twin nursery have the potential of being a large expense. Laying new carpet is great, but may not fit in the frugal budget. Area rugs offer a great alternative to new carpeting and can be found at several retail chain stores at pretty reasonable prices. Don't forget, some older homes have their original hardwood floors hidden under old carpeting. You may be able to refinish these floors yourself, sometimes with magnificent results. This is probably a project that you should discuss with someone from the local hardware or home store before starting if you're not sure where to begin. Just be sure to start well before your twins arrive...some projects can take longer than you think! In the end, every parent desires the ideal nursery for their new twin babies. I am sure in a perfect world, we would all appreciate the luxury of going out and buying everything we need at a posh baby boutique. The average money conscious family generally can't afford to purchase everything brand new, but that does not have to limit their ability to create an adorable room for twins. Investing a little time and patience while shopping for your items will pay off in the end. The budget shopper chooses their items thoughtfully, making sure that their investment is wise. This way, the budget twin nursery you create can become the nursery of your dreams!